“Untitled (11)” is part of Kevin Beasley’s show of sculptures and sound at the Institute of Contemporary Art. “Strange Fruit (Pair 1),” the first work you encounter in Kevin Beasley’s self-titled solo exhibition at the Institute of Contemporary Art, calls out to the song Billie Holiday made famous, about lynching and the stains of violence and dehumanization we cannot wash from our hands. It’s one of a poignant and penetrating trio of works in the first gallery of Beasley’s show of sculptures and sound, up through Aug. 26 at the Institute of Contemporary Art. A pair of Nike Air Jordans hangs from the ceiling, as if a kid has tossed his prized sneakers over a telephone wire. Beasley soaked the shoes in resin, and they bulge and blister like chunks of tortured flesh. Speak into a microphone embedded in the piece, and your voice echoes at a high pitch — a ghost’s squeal. Carefree youth and lynching victim are one. Now, as ever. Nearby, standing witness: “Untitled (Rhythm and Blues),” three housedresses hardened by resin into empty, mournful, hooded forms. 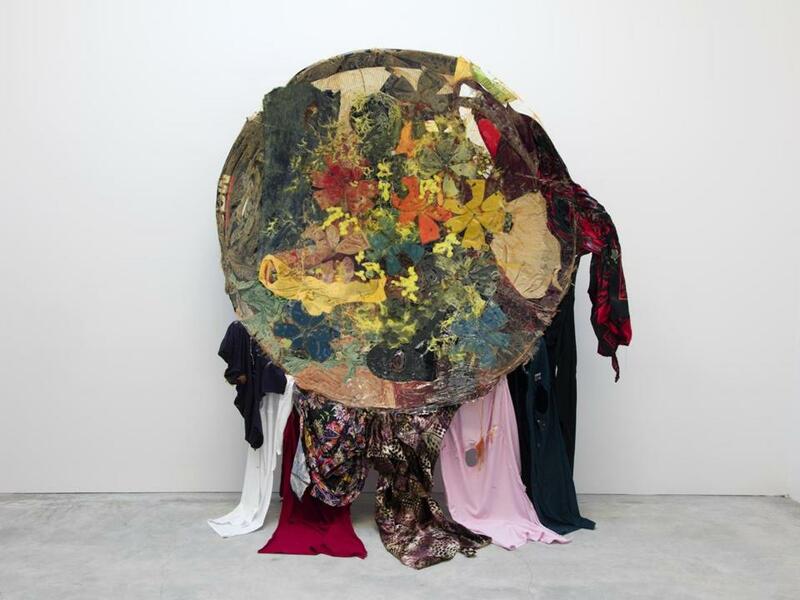 There’s some relief in “Untitled (11),” a florid, painterly work, concave as a satellite dish, with resin trapping T-shirts, housedresses, and bandanas. Baseball caps cut open along the seam look like flowers. It’s festive and messy, an image, perhaps, of a certain kind of recovery from the ravages of the past. Or is it? The disc concentrates sound waves. Find the sweet spot in front of it, and “Untitled (11)” makes your voice stronger and crisper. The magical and unnerving effect switches the power dynamic between viewer and art. The sculpture — usually the object of our cool perusal — co-opts us into the grievous picture drawn by this suite of works. Beasley, who was born in 1985, belongs in a lineage of black artists such as David Hammons and Nari Ward whose works revolve around reclamation: Parlaying scarred and worn castoffs, airing out lingering wounds, and alchemizing dark histories. His show at the ICA, organized by curator Ruth Erickson and assistant curator Jeffrey De Blois, is fluid and unflinching. A place to bring your grief. Bodiless figures made of empty clothes treated with resin haunt the exhibition. The Nautica rain jacket Beasley wore in high school stands alone in “Untitled (. . . just watch).” Barely over 3 feet tall, its shoulders narrow like a small child’s wearing a man’s clothing. Its hood is empty. It could be Trayvon Martin, wearing a hoodie when George Zimmerman fatally shot him. It could be 12-year-old Tamir Rice, killed by police on a Cleveland playground in 2014, the year before Beasley made this piece. The artist often quotes music in his titles, and I wonder if “just watch” reprises Mark Ronson and Bruno Mars’s irrepressibly catchy 2014 tune “Uptown Funk,” with the chorus “Don’t believe me just watch.” As with the kicks in “Strange Fruit (Pair 1),” Beasley sets youthful brio against spectral absence, and it stings. In these works, small details of sound and pattern evoke whiffs of warm-blooded presence that make the sense of loss more wrenching, and indeed eerie. Radiant floral polyester housedresses and kaftans hover under a canopy in “Phasing (Ebb),” their neck holes gaping like the empty hoodie. 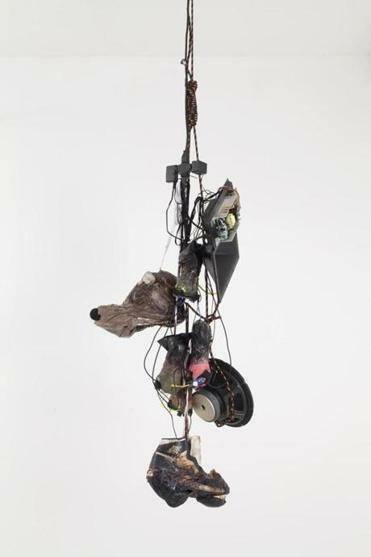 Disembodied voices emerge from the floating figures; Beasley has placed speakers inside, connected to mikes in another gallery. “Yes,” one said with conviction while I was there, and I checked an urge to run. Are these sculptures grandmothers sitting on a doorstep, watching children play? Are they the children who still should be playing? The show’s final gallery features Beasley’s most recent work, which he calls “slabs”: clothing and other items arranged in rectangular molds and encased in resin. These big pieces swirl with gesture and brilliant color. Think of sarcophagi carved with celebration, or of fossils containing the imprint of life. “A View of a Reflection,” with a large, coppery disc on the left and blue below, might be a seascape. At the same time, the patterns, the textures, and the jostling forms pull us into abstraction. Then the sleeves, skirts, and pant legs push in another direction: These are vestiges of people. This is the past, jewel-toned and vital and filled with T-shirts and chintzy florals, beating at our shores, unlikely ever to go away. The ICA presents “Caitlin Keogh: Blank Melody” in tandem with Beasley’s show. Empty clothes show up in both exhibitions, but that’s not enough to make this pairing work. Beasley roots his art in real life, and Keogh, a painter, confines hers to esoteric discourse: art theory, art history, and poetry. “Blank Melody, Tears, Shoes” is part of “Caitlin Keogh: Blank Melody” at the ICA. Her paintings respond to Charity Coleman’s poem “Blank Melody,” which in turn was a response to previous paintings by Keogh: a claustrophobic chute into an imaginal world increasingly removed from the rest of us. The paintings are clever, if antiseptic: surreal, graphic, flat, intentionally made in styles that echo technical illustration. 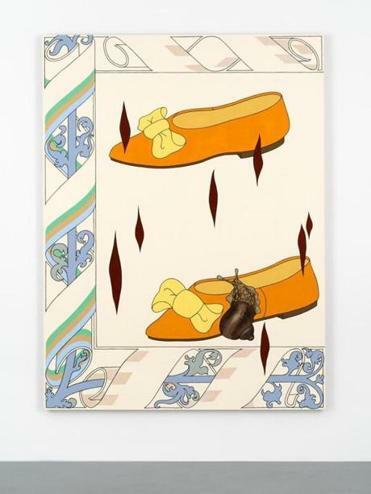 At their core, they address female subjectivity, using fractured figures and garments, such as the slippers in “Blank Melody, Tears, Shoes” to imply a self impossible to pin down. After #MeToo, this absent or fragmented depiction of women seems like a relic, a product of a long dissociation now ending. I’m not sure what comes next in the portrayal of women. Perhaps an assertion of women in command of their own, complete, glorious bodies. Beasley’s lush and sculptures are anchored in fleshly experience. Beside them, Keogh’s overly smart paintings are bloodless, and now is not a moment to be bloodless.